The XAU/USD pair continues to move up and down in a channel struggling to break away in either direction. After slumping towards the $1302 level earlier in the day yesterday, the pair took advantage of the selling pressure surrounding the greenback in the early North American session to rise above the $1310 level reaching a peak of $1314.4 per ounce. The US Dollar's selling pressure came after the US Census Bureau reported that retail sales declined by 1.2% on a monthly basis in December. On top of that, J.P. Morgan announced that it slashed its year-end federal funds rate expectation to 2.75% from 3% for 2019 and to 3% from 3.5% in 2020. 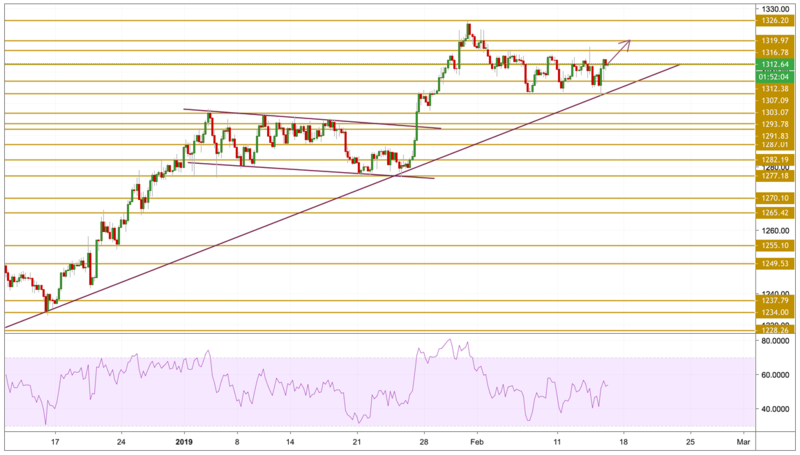 After hitting a daily low of just below the $1303 level, Gold prices gained traction and surged above the $1310 level again as the purple trend line presented on the chart provided a strong support. The price is currently hovering around the $1312.38 support level with a rising momentum which is only getting stronger. We expect the upward move to continue and our next target will be the $1319.97 resistance level.